Through Eurofins ETC, we specialise in providing a wide array of first-class calibration services worldwide; currently exporting to over 30 countries across mainland Europe, the Middle East, Far East and the Americas. Eurofins ETC is one of our Eurofins Product Testing UK’s partners. 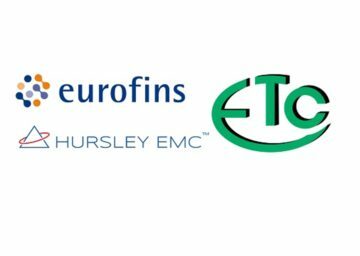 Eurofins ETC has been involved in calibration for over 25 years and has a vast wealth of engineering knowledge spanning a wide range of equipment and standards. Their extensive experience and background in EMC testing, combined with excellent customer service, makes them the first choice for Radio Frequency (RF) & Transient calibration for many global test facilities. Eurofins ETC’s environmentally controlled RF Standards Room provides an exhaustive range of RF & Microwave measurements up to 40 GHz. It is often not practical or even possible to send equipment away for calibration. With this in mind, Eurofins ETC offers on-site calibration, whereby one or a small team of highly trained engineers come to your location for a pre-determined period to perform all of the required calibrations. This service is available across the UK and Europe, including bespoke packages to suit your requirements, and ensures your downtime is significantly reduced. Eurofins ETC offers a free collection and delivery service across England & Wales with their standard service offering a five working day turnaround of all calibration equipment. Customer equipment is collected and delivered using ETC’s fleet of specially designed, foam lined vehicles; negating the need for time and money to be wasted on expensive packing materials. For the full range of Eurofins ETC’s UKAS accredited calibration laboratory No. 0452 capabilities including temperature, dimensional, pressure, torque and force, please visit the Eurofins ETC website here or contact them on +44 (0)1237 423388.